Keniey Sonley, left, battles Chad Cook at the Burly Thumblemania tournament April 6. Maggie Scivicque-Spencer attempts to battle out of being pinned in the Burly Brewing Co. Thumblemania thumb wrestling tournament. The tournament was open to all to try their thumbs at winning the championship belt. 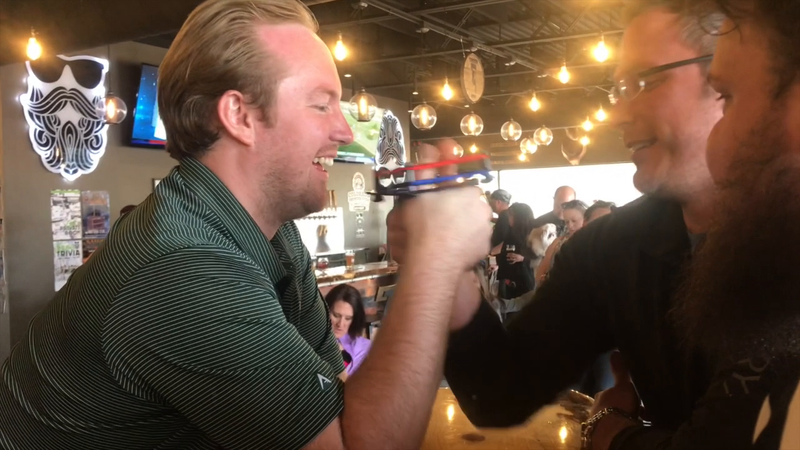 Jon “The Average John Cena” Lopata took down Gary Atherholt in the first-round of the BURLY Brewing ThumbleMania tournament April 6 in a back-and-forth bout lasting a grueling 90 seconds. Lopata's secret? Make his opponent laugh to throw him off guard. A steady diet of beer and food truck food, Lopata said, was crucial for staying in shape for the event — even if he didn't come there to be reluctantly called into the ring. The weekend of WrestleMania 35, the annual WWE professional wrestling event, BURLY Brewing Co. in Castle Rock had its own fun with a championship belt awarded to the top thumb-wrestler to step to the stage. The winner received a custom-designed championship belt. Lopata didn't take home the championship belt. But he's proud of the work he put in. “I like to push myself to the limit every day,” Lopata said.